* AD – We were gifted these 2 games for the purpose of this post. We are still celebrating the blogs 4 year anniversary with freebies and competitions. You can check out some of the previous competitions for sticker books, a travel subscription box and a free STEM subscription box here. However today we are collaborating with the wonderful Orchard Toys. 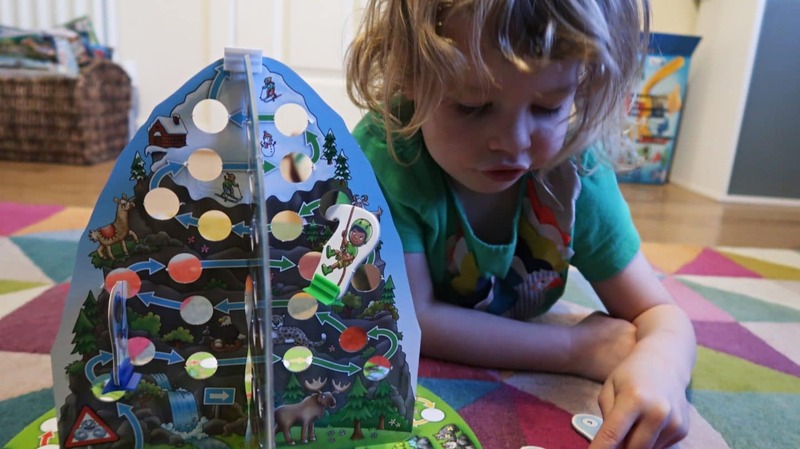 The quality, educational games from Orchard Toys are always a favourite of our family, I think most kids must have at least one of their games in their collections?! 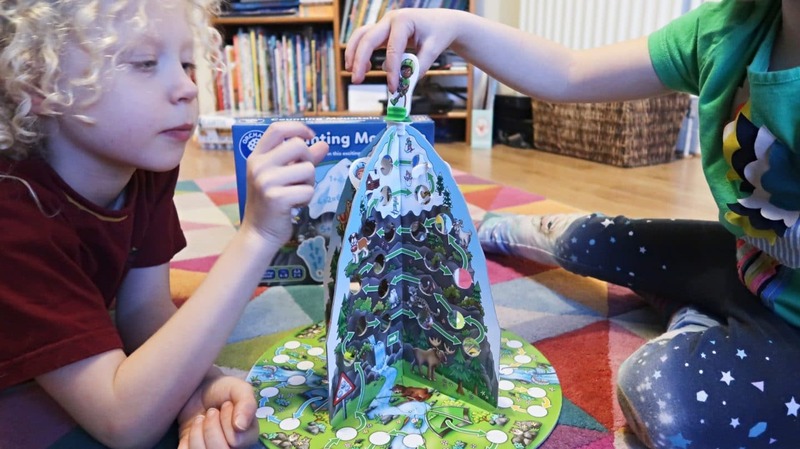 Orchard Toy new games for 2019 include Counting Mountain and Magic Spelling. Have a read of our reviews of the games below and then scroll to the bottom of the page to enter our competition to win one of each of the games. 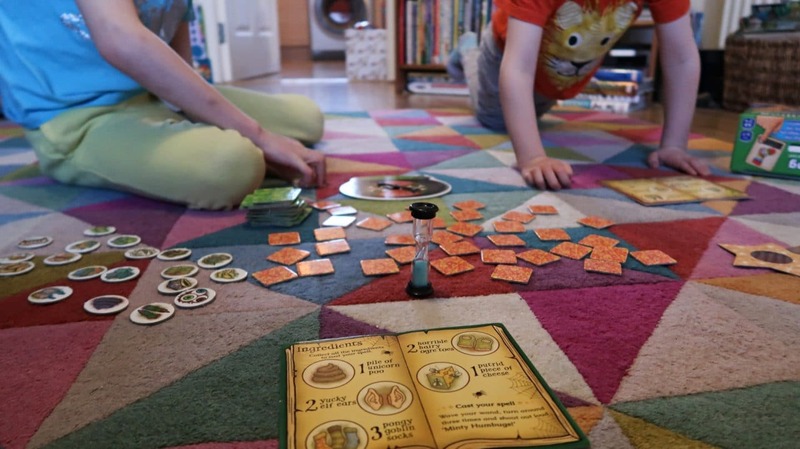 I knew my two would absolutely love the counting mountain game as soon as I saw the picture of it! A 3D mountain where the game pieces are small climbers, which hook onto the little holes to reach the top of the mountain first. The aim of the game is to to turn over the footprint cards and add together the number of prints on each footprint to see how many places you can move forward. Starting in the meadow (flat area) you work yourself up the mountain. However, the catch it that some of the footprint cards have Yeti’s on them! If you turn over a Yeti and a number card (and you are on the mountain) you have to go backwards that many spaces. If you happen to turn over two Yeti cards everyone on the mountain sections has to go back 2 spaces! After each turn you shout BLIZZARD! Then mix up the footprint cards to hide all the Yeti’s. My eldest (7 years old) finds the counting easy, however it’s just enough for my 5 year old to understand and enjoy. 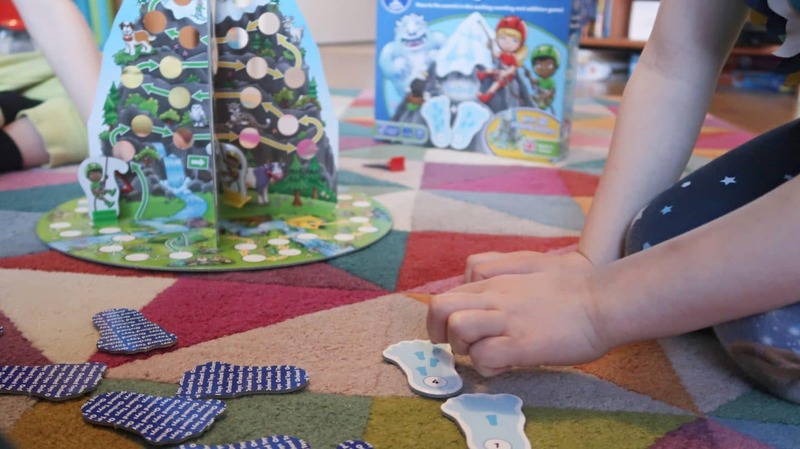 Both children love the whole concept and after initial annoyance and the Yeti making them turn back down the mountain, they really got into it! The winner gets to balance their winning pieces on the top of the mountain, which is clearly a happy moment for the winner! There’s nothing that I can fault in the game, it works perfectly and encourages counting. Plus the kids love it! 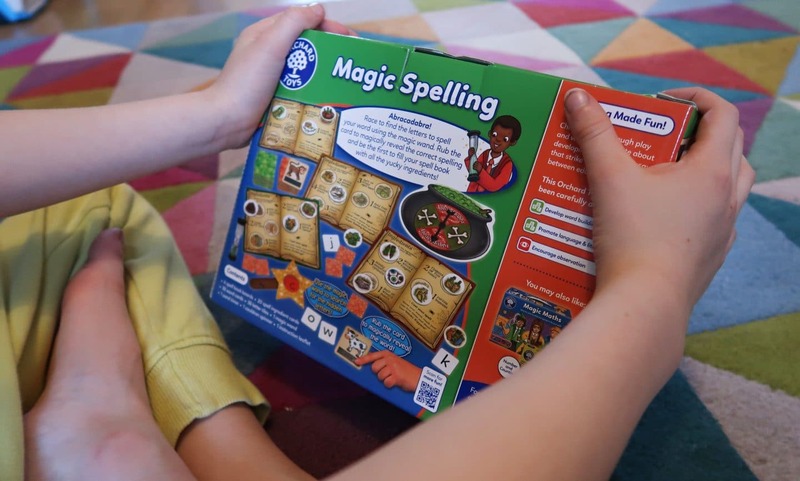 The idea for the new Orchard Toys game, Magic Spelling, is fantastic. 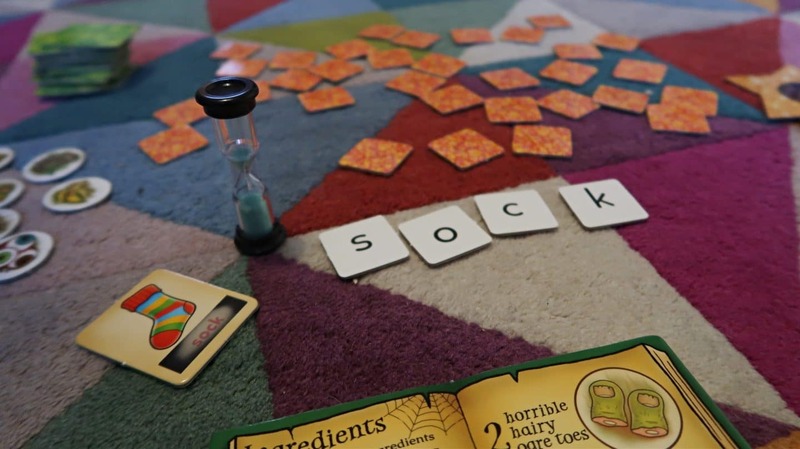 A magical themed game to encourage children to spell words to create their own magical spells. 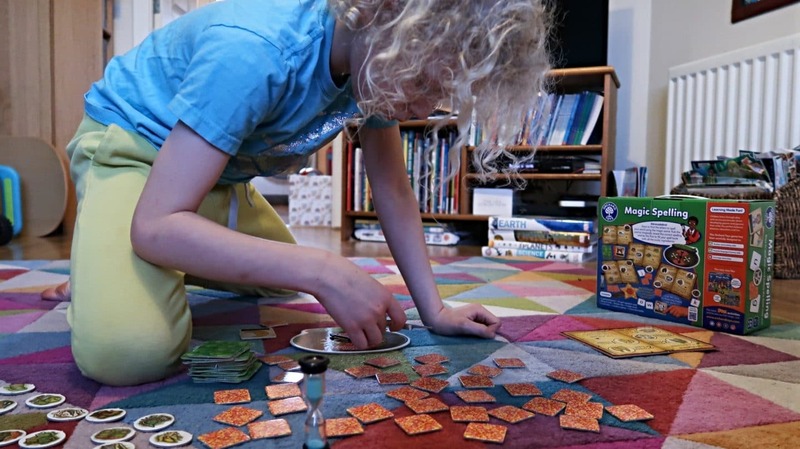 My eldest enjoys this game, but it’s a little harder to get your head around for a few reasons, I’ll get into these in a minute once I explain how the game works. First you need to turn over a word card that shows you a picture of something, you need to have a quick think of how to spell this. When you are ready the timer is turned over and you have until the sand runs out (45 seconds) to find the letters to make up the word. The letters are on the orange dotty cards that you need to use a wand with a red film inside that ‘magically’ allows you to find the letters. If you find the letters before time is up you can check they are correct by rubbing the black rectangle under the picture of the word card. Presuming you spelt the word correctly you can then spin the cauldron to find out whether you gain an ingredient or lose one! The winner is the first person to find all their ingredients and cast their spell! Confused?! I hope not, but there are quite a few steps here which can make it feel a bit more difficult than it should be. The first, more minor issue we have is that the wand is rather flimsy. All the rest of the game pieces are the standard thick card you will find in all Orchard Toys games. But the wand doesn’t feel like it will last very long. Secondly it isn’t easy to find the letters squinting through the wand, waving it over each letter card one at a time. So even I, never mind the kids, was running out of time to find all the letters for 3-4 letter words. It would be impossible to find all the letters for longer words within the timer. We came up with two solutions to this, the first we give everyone a second turn of the timer (perhaps a longer timer would be an idea for Orchard Toys to create?). The other solution was to put the wand up to your face and look at all the letters from further away (rather than right above each card), you can see them all and grab the correct letters easily. If you don’t double the time or change how you look through the wand, then you won’t be pleased when after the hard work of finding the correct letters you don’t get the ingredient as it lands on the wrong part of the cauldron! This did cause a couple of tantrums until we turned the timer over twice. 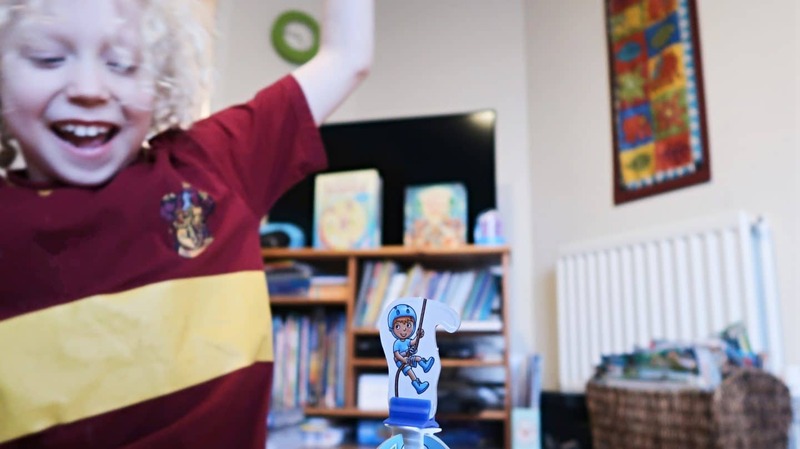 So the verdict is that the game is good and has definitely helped our eldest with his spelling, it would be better if the timer was doubled to 1 1/2 minutes and that the wand was made of thicker card like the other game pieces. 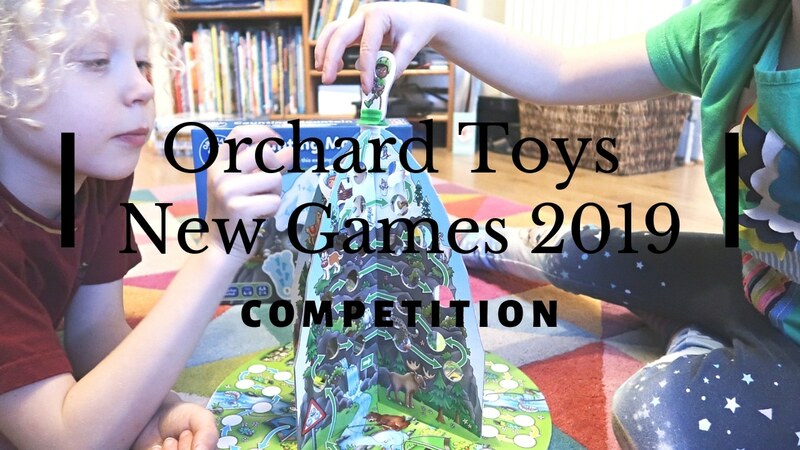 Win your own set of Orchard Toys new games, 1 x Counting Mountain and 1 x Magic Spelling, by filling in the form below!